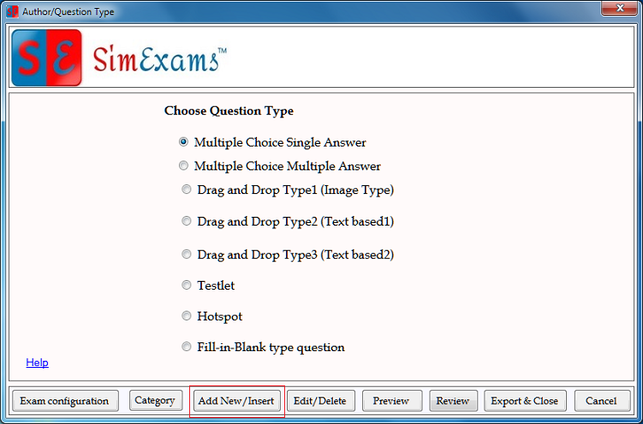 In this question type minimum 4 and maximum 6 answer choices can be given for each question. candidate has to choose one correct answer. 1. Entering a new question : To enter a new question select "Multiple Choice Single Answer" under "Choose Question Type" and click on "Add New/Insert". Choices : Total 6 choices (answer options) can be provided for the question. Each question must have at least 4 answer options [choice5 and choice6 are optional]. Enter the choices (answer options) in these fields. Correct Answer : Each choice (answer option) is provided with a check box field which can be checked to mark that choice as correct answer for the question. This question type can have only one correct choice (answer). Exhibit : This option allows author to select the image file (if required) for the question. To select the image click on "Exhibit" button, browse to the image file location and select it. 2. 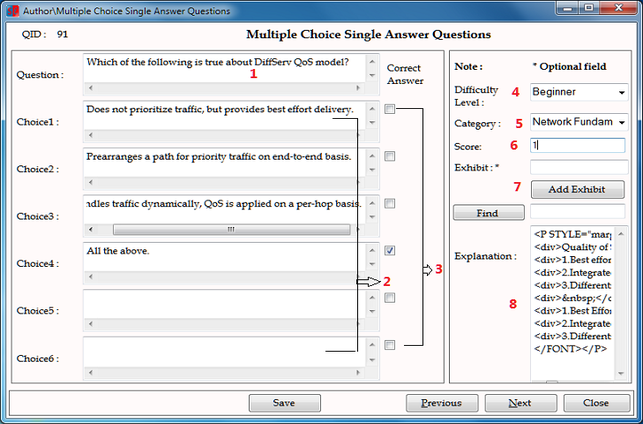 Edit an existing question : To edit an existing question select "Multiple Choice Single Answer" under "Choose Question Type" and click on "Edit/Delete". 3. Delete an Question : Follow the steps to open the question for editing (Edit an Existing Question) and click on "Delete" button to remove the question from the database.